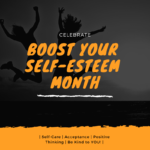 Having a high self-esteem can be a preventative measure for mental health disorders, and is good practice to maintain good general health. In our current society, it is easy to fall into the trap of constantly comparing ourselves to those around us, and trying to constantly portray the best versions of ourselves. It is easy to feel inadequate under the pressure. Studies have shown that social media has made it harder for many to feel like they are good enough, because of people constantly comparing themselves to each other, which is augmented by people sharing only the best parts of themselves on social media. This can create unattainable goals for many people and result in lowered self-esteem. Given this constant competition for self-perfection, it is important for people to take a step back to try to understand themselves and who they are. This can help boost their own self-esteem and feel more comfortable in their own skin. It is important to actively catch yourself in your own negative criticisms and to turn your negative thinking around. Work to either counteract your negative thinking or to incorporate change into your life. Self-care is another integral part of maintaining your own self-esteem. Exercising regularly, making sure you are being healthy, and maintaining your favorite hobbies, can be part of a healthy lifestyle. You will be more prepared to take on the challenges in life, the healthier and more cared for you are. Keeping yourself at your best in terms of health can only add to your mental well-being. Negative self-talk is prevalent in a variety of mental illnesses, like anxiety and depression. A key part of Cognitive-behavioral therapy is to take an active approach in realizing when you are being too critical of yourself and turning that thinking around. Negatively labeling yourself or allowing others to negatively label you can be detrimental to your self-image. By fighting negative thinking, you can boost your confidence, remind yourself of your accomplishments, and carry on. If you are struggling with your mental health or self-esteem, please feel free to contact the professional team at Lifeline Connections for help! Getting help, whether it is through self-help or by reaching out to professionals is an important part of recognizing that you are struggling and is a good step forward to get the help that you need. You can visit Lifelineconnections.org or call 360.397.8246 for more information.